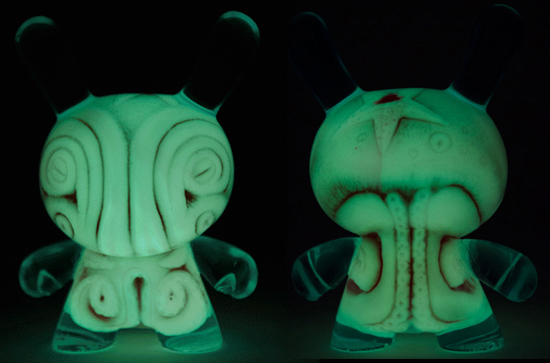 Features: Interior skeleton glows in the dark. Made of resin. Head and arms have no articulation. This figure - a PIQ Grand Central exclusive - was triple cast with a solid green interior covered in a GID interior skin and a blue tinted exterior. There were originally 50 figures made, but confusion regarding the stated edition size led Clutter to pull the remaining 25, which were set to be released online. Those 25 figures were eventually made into the GID Blue Fade edition.